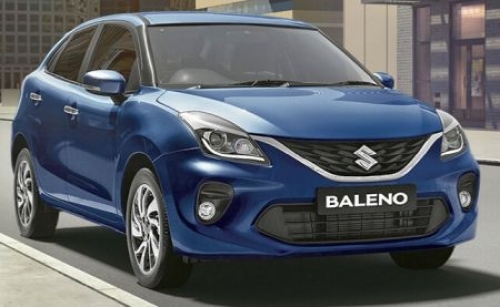 By Pradeep Peter, Kochi, January 29: Maruti Suzuki has launched an updated version of Baleno in Indian market. This time in a premium hatchback avatar, priced between Rs 5.45 lakh and Rs 8.77 lakh. New model features a wider grille, new 16-inch machine-finished alloy wheels, a brand new front bumper and a modern 7-inch touchscreen. Safety features includes of dual airbags, ABS (anti-lock braking system) with EBD (electronic brake force distribution) and brake assist, pre-tensioner and force limiter seat belts with reminder, ISOFIX child restraint system, speed alert system and rear parking sensors are standard across variants. Interior is classy with a blue-black theme and dark metallic accents on the dashboard. Engine options remain unchanged with the 85PS 1.2-liter petrol and 75PS 1.3-liter diesel doing duty under the hood. Well, Baleno 2019 face-lift is a more value for money than ever before. Available in 11 variants, Prices start at Rs. 5.45 lakh for petrol and goes upto Rs. 8.77 lakh. Diesel variants start at Rs. 6.60 lakh and the top-end is priced at Rs. 8.60 lakh.